Ethnic Uzbek women plea for help at a refugee camp outside of Osh on Tuesday. 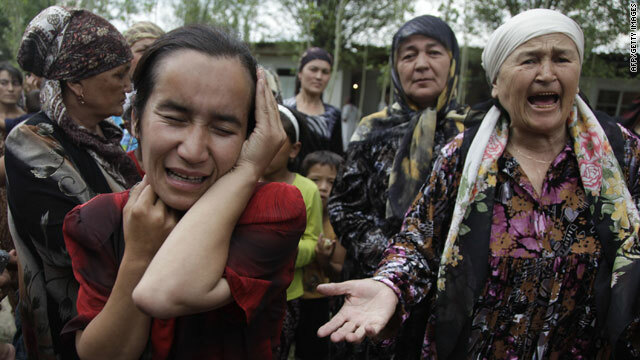 Another senior U.S. official says consensus among major powers is "coordinated international response"
Washington (CNN) -- As thousands of ethnic Uzbeks flee attacks in Kyrgyzstan, the United States is providing humanitarian assistance to the impoverished country and evaluating what further help may be needed, including military. 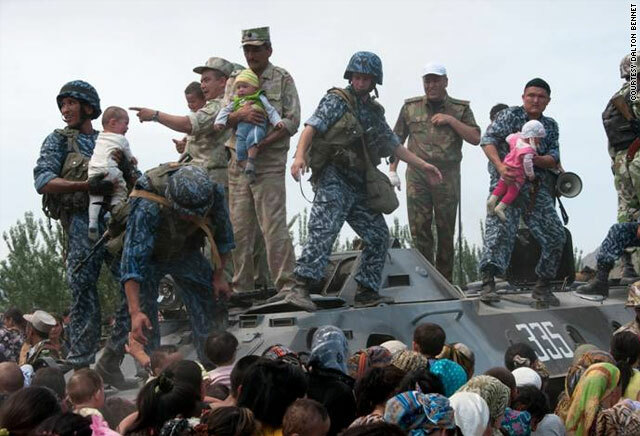 "Right now our focus is humanitarian but it remains to be seen exactly what, if any, security assistance Kyrgyzstan needs," a senior U.S. official says, "and that will be driven by what happens on the ground over the coming days." The official spoke on background because of the diplomatic sensitivity of the issue. The official made clear the U.S. is not considering acting alone to provide any security assistance. State Department spokesman P.J. Crowley said Tuesday that Assistant Secretary of State Robert Blake, traveling in the region, spoke with interim Kyrgyz President Roza Otunbayeva, and discussed what international help the country needs. Wednesday, Blake will be in Tashkent, Uzbekistan and will travel to the Fergana Valley, on the border with Kyrgyzstan, to see first-hand the refugee situation and consult with the U.N. and the Red Cross. Friday and Saturday, at the direction of Secretary of State Hillary Clinton, Blake will be in the Kyrgyz capital, Bishkek, for direct talks with the Kyrgyz government. The interim government, formed by opposition leaders after the previous government was overthrown in April, has asked Russia to provide troops to help quell the violence but Moscow has not complied, conferring instead with regional security partners. "I don't think you're seeing Russia rush into Kyrgyzstan either," the senior U.S. official says. The next possible step, he says, could be providing medium-term economic assistance. "We understand their need is great. They want a lot of stuff and we are going to respond," he says. No one, he says, is talking about the United States, on its own, providing any security or military help. "I don't think anyone's talking about unilateral help," he says. "I think the consensus here -- the United States, Russia, other countries -- is to work this internationally. That's our approach. We think that a coordinated international response is the way to go." The U.S. military says the interim Kyrgyz government has presented an official request for a variety of aid from the U.S. government. In the past few days, according to the State Department, the Obama administration has provided $800,000 in humanitarian assistance. That includes medical emergency supplies, bandages, surgical instruments and clothing.